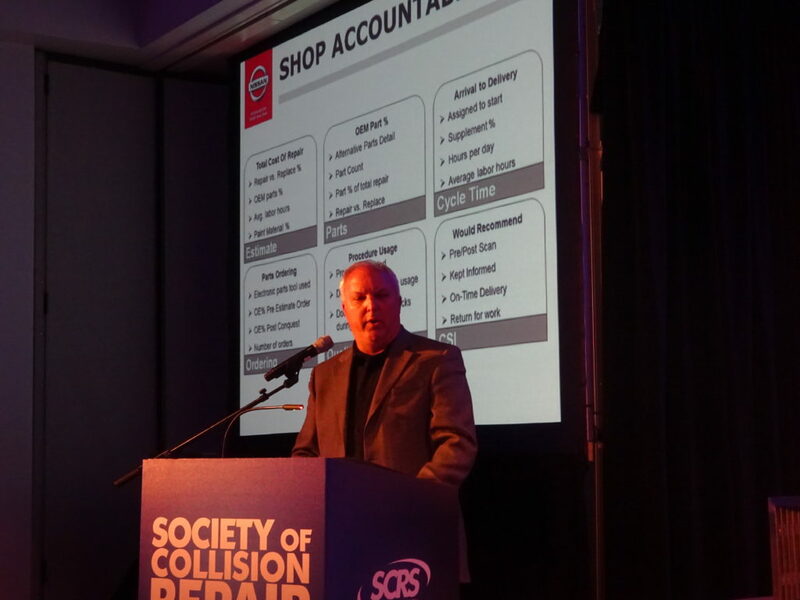 Nissan is detecting crashes and recommending certified auto body shops for owners of connected cars, and the OEM plans to refine these referrals to account for shop performance on Nissan metrics, collision parts manager Mark Zoba said at SEMA earlier this month. The same considerations will apply to referrals made via a call center Nissan provides for the owners of unconnected vehicles after a crash. Nissan provides free towing of up to 50 miles — even if the vehicle is out of warranty, Zoba said — a big plus for the Nissan owner and the network of collision repairers. Regardless of age, “we’ll tow it to a certified shop,” he said. Zoba told the presentation he asked network shops what they needed from Nissan, and their response included wondering what Nissan was doing to drive volume to their facilities. 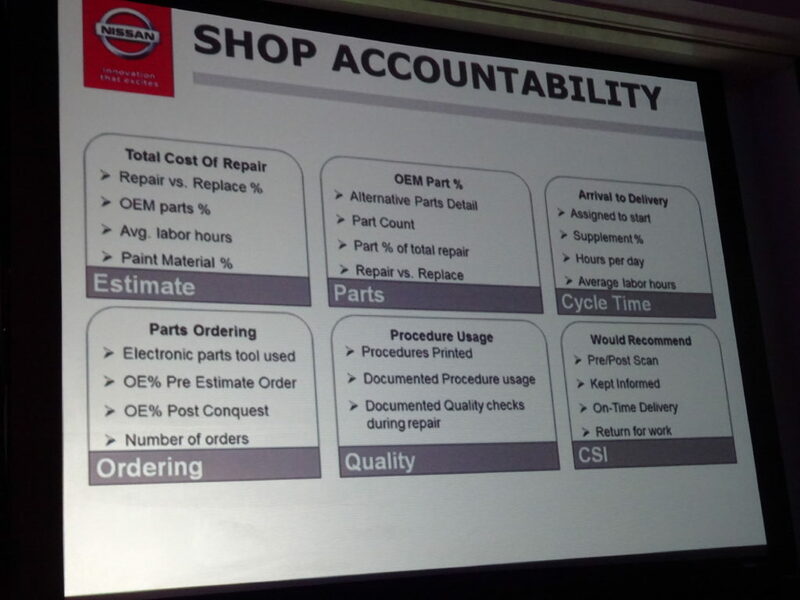 For 2019, the OEM will develop a “smart shop locator” which would prioritize facilities delivering repairs the way Nissan wanted, according to Zoba’s presentation. Certified shops failing to meet Nissan’s terms would be asked to step aside, he said. The OEM already is recommending certified shops for connected cars reporting a crash and when customers in non-connected vehicles call Nissan for assistance after a collision (1-800-NISSAN-1), according to Zoba. “It happens now,” Zoba said of connected car referrals. Nissan is alerted if an airbag has deployed. If not connected, the owner can still call the 1-800-NISSAN-1 number, which will connect them to Nissan’s towing supplier and provide a list of shops. Eventually, the vehicle itself could be another factor in making recommendations to customers, according to Zoba. “I think down the road, as it gets even more and more vehicle-specific, and with a connected vehicle, we’d be able to say, ‘OK, based on this vehicle that we know, it really should go to one of these shops,'” Zoba said. He said Nissan wanted the customer to have the “best experience,” which could involve suggesting particular shops “‘based on your vehicle. '” Another Nissan make might prompt different shops to be recommended, he said. “It’s a function of knowing what features are on that vehicle,” Zoba said. Ultimately, a connected car would send Nissan back elements of the crash itself to further refine the recommendation. He said Nissan could know the amount of force, speed and points of impact and it could start to build a “good understanding” of the vehicle’s status. “Through there, you can make recommendations,” he said. 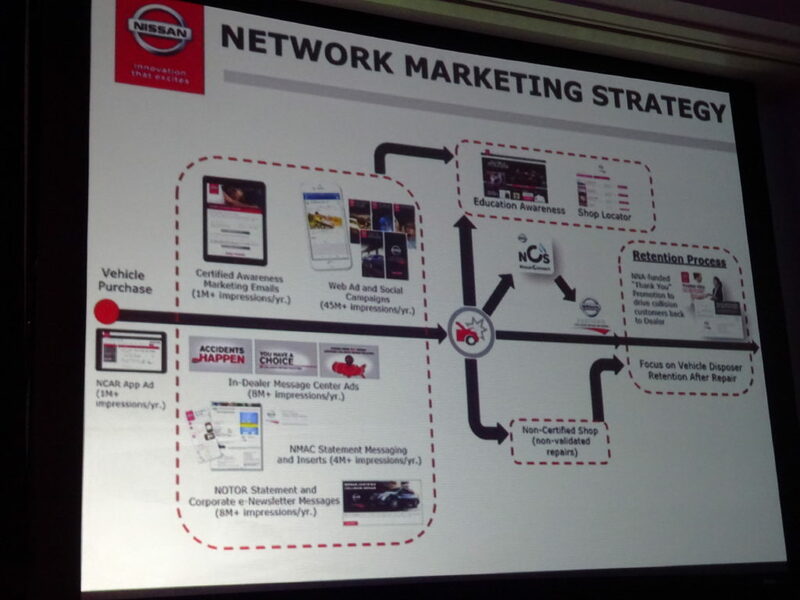 In terms of lower-tech perks for Nissan owners and shops, Zoba said the company had a marketing strategy to promote the shops “right from the start.” It has generated 60 million impressions to Nissan owners and consumers about the benefit of certified shops and OEM parts, he said. 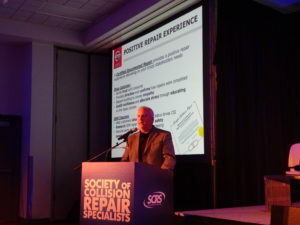 It also gives customers a $25 gift certificate for Nissan dealership service centers after they patronize a certified collision repairer, according to Zoba, and certified shop customers whose Nissans are totaled can get a special discount on a new car.